The grapes for the Dutschke “St. Jakobi” Shiraz come from a small 5-acre (32 rows) planting of Shiraz vines on Ken and Helen Semmler’s St. Jakobi Vineyard, planted by Ken (Oscar’s son & my uncle) in 1975. This special planting of vineyard consistently produces high quality fruit year after year and gives us wine that is rich in spice, dark cherry and chocolate characters with fullness and wonderful structure for longevity in the bottle. Picking across this block on two separate occasions gave us two individual parcels of Shiraz. A contrast of East vs West. The parcels are fermented separately in static open fermenters under the verandah at our winery on Gods Hill Road and each batch of wine is then transferred to a range of new and older French and American barrels, supplied to us by 9 different coopers. Using a wide range of different oak hogsheads gives us a better opportunity to put together a more interesting wine than if we were to use oak from only one supplier. 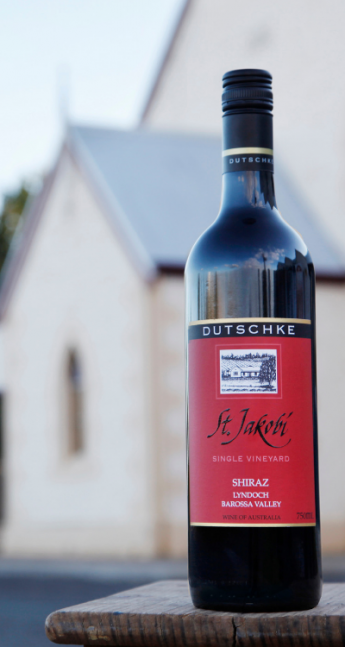 The 2015 St. Jakobi Shiraz shows a range of flavoursome dark berry fruit flavours, is mouth filling and finishes with fine drying tannins. It displays the full potential of the Shiraz fruit that grows on this “precious patch” of dirt. From Ken Semmler’s vineyard planted ’78, destemmed, open-fermented with cultured yeast, matured in French hogsheads (33% new) for 18 months. Deep crimson-purple; a full-bodied Barossa Valley shiraz straddling traditional and newer winemaking philosophies and practises (the latter mainly in the form of the french oak used). Its depth and balance will see this wine transform itself over the next 10 years and flourish for 20+ years thereafter.